I’m in Hexham on the weekly town trip. A parking space opens up opposite the library and I race in. First assignment; return two library books and check-out this weeks copy of the New Scientist for one of the senior monks. My coat pocket strikes up a jaunty tune and I dive for my mobile phone. “Reverend Mugo, sorry to bother you, have you been to Tesco’s”? “No” I answer honestly, while remembering I wasn’t due to go there anyway. “Could you pick up five heads of winter greens please”? “Sure”. Then I ask jovially, “What’s it worth”? Serious silence prevails from the monastery end of the conversation. I interject hurriedly, “Oh never mind about that I’ll get the greens. No problem”. I make a mental note to not tease or joke around with the novices, until they know me better. Onwards to three banking assignments, a visit to the one and only haberdashery counter in the town for ribbon and elastic, Boots the Chemist for cough medicine and lozenges, then drop off a bag of clothing at a charity shop. Each assignment has a separate piece of paper with detailed instructions; the shop, what to buy, the brand name, the number of bottles or packages etc. Doing the town trip reminds me of tests we did in Girl Guides. Go to this map reference, head due north ten paces, look up and read message, “Go to nearby village, buy five heads of winter greens and cook them on camp fire. And be back by 5.00”! I take a break for coffee and toasted tea cake before proceeding, not to Tesco but to the newly opened Waitrose. Haven of peace and plenty as it is, since most people are at Tesco’s! Lingering over coffee a booklet catches my eye, the word BALTIC stands out boldly. It’s a catalogue for a Centre for Contemporary Art, Gateshead Quays near Newcastle. Later, back in the monastery, I discover the centre was started by a congregation member, who is not a million miles away from here either. It’s a small world. People are sometimes surprised that monks do, so called, worldly things. For example that a monk would carry a mobile phone, or that they would ‘dive’ for it. Would we be more likely to reach sloooowly and serenely into our well organized pocket, then press the right button first time? We would probably be thought not to joke around for sure! Will the novice I spoke to doubt because I joked with her and she didn’t get it? Probably not. However doubt in the practice can set in as a consequence of such seemingly inconsequential events and events of great seriousness too. The arising of doubt and loss of faith, and their place in practice, is a worthy subject to take a look at…another time. I hope you enjoyed shopping with me today. While everyday life may look ordinary, below the waves of activity the life is extra ordinary. If one is not swayed by appearances, or holding to expectations. This is not easy or simple, yet leads to deepening understanding. 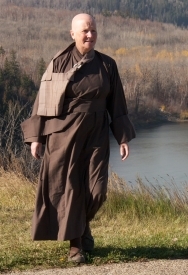 When I first went to visit Throssel, some 13 years ago, I thought the monastry would mean no cars, no telephones and no computers, let alone mobile phones and blogging monks…! Quickly I found out how wrong I was! Thankfully. Tim, One can use or abuse anything of course. Hopefully I’m making good use of the Internet in terms of offering spiritual encouragement and Refuge. I’m glad you found the Sangha and have stuck with it. Thank you for your comment, and your wave. A couple of days ago, I was looking at some of the photographs that had been taken when Dharmavidya and Sujatin visited you last year – so you have been in my thoughts as well. I’m very grateful for all the contact we’ve had. I find myself blogging less these days, as my daily life is so full, and also fills my need for reflection – I hope to find a diffent way of writing soon, that’s compatable with this new lifestyle. Hello Rev. Mugo, I love your sense of humor but can see how a novice might misunderstand. Thanks for the shopping trip! I have always been miffed that monks are usually way ahead of me on seeing the latest good films!